Sagatani Sanri is on the path of Shikoku’s 88 Temple Pilgrimage. From the 37th temple in Shimanto Town, Iwamoto Temple, to the 38th Buddhist temple at Cape Ashizuri, Kanji Fukushiji, it is approximately 88km. It is the longest section between two temples on the pilgrim’s trail. In this area academic research was conducted that was the last confirmation of river otters in Japan. The original landscape of Japan can still be seen along the winding Iyoki River. It is a treasure trove of folk tales, as compiled in Sagatani Mukashibanashi, The Tales of Sagatani. In this area, mulberry cultivation has been thriving since the late 1800s (the Meiji era) and in particular a variety called Wakayama Mulberry, which is produced in the Kobushino River area, came to be regarded as the best source for paper production in Japan. After that, however, with the spread of machine produced paper and the changing of the era, Wakayama Mulberry paper production ceased. However, local 6th graders in elementary school made papers for their diplomas with their own hands. The enthusiasm of locals wishing to keep and continue their culture bore fruit in due course. 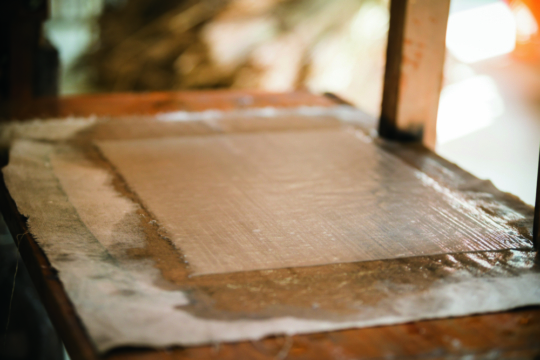 Washi (Japanese paper) is a valuable cultural asset that must be renewed and preserved. In 2009, to renew and preserve the tradition of excellent quality paper making, with the cooperation of the General Incorporated Foundations World Paper Heritage Support Foundation, Kamimori was established, and full-scale cultivation of Wakayama Mulberry resumed. 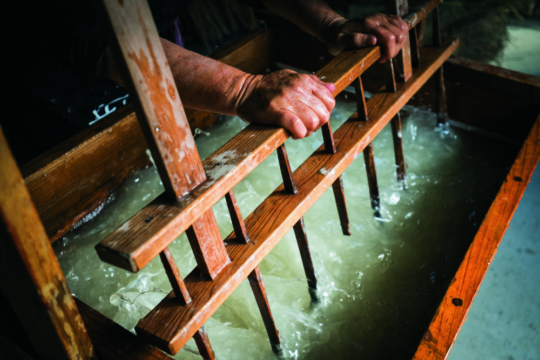 Currently, in this area, using only the renowned Wakayama Mulberry and natural materials, you can experience traditional paper making, and not just simply making paper, but also the traditional methods of chiritori and dakai, dust removal and solution. the beautiful sandy beach is our museum. © KUROSHIO SUNABI MUSEUM All rights reserved.